Where has all of my time gone? I used to have a lot more – and little at a time it has been taken away from me. I am lucky if I am able to cook or bake anything over the weekends these days – and I am living one day at a time. If I can make it through the day without anything slipping through the cracks – that is success. But cooking has not been the priority lately (aside from dinners each night, which have been served later and later each week). Fortunately, I know that things are about to change soon, so there is no need to completely give up hope at this point. So, I went to the famer’s market to see what was in season. There was one stand with a few stalks of rhubarb, but the price scared me away – so I ended up at my favorite apple cider stand. I almost bought the normal spiced cider that I buy in the fall, when I noticed he had some raspberry apple cider. That was it. This is one of the easiest jellies to make, and with the addition of raspberry, I wouldn’t even add any other spices. Sold. Fill your canning pot with water and begin to bring it to temperature. Wash your jars and rings in warm soapy water and set aside. Put your lids in a small pot of water and heat (but do not boil) in order to soften the sealing compound. Measure the sugar into a blow. Whisk the powdered pectin into the sugar to blend. In a large, nonreactive pot, combine the cider and the pectin-spiked sugar. Bring to a boil and cook over high heat for 15-25 minutes, stirring frequently, until the volume in the pot is greatly reduced. While you continue to stir, clip a candy thermometer to the pot and watch until the pot reaches 220 degrees F. There will be a great deal of foaming and bubbling before it reaches this point. It should look thick and syrupy and the bubbles should look glossy. 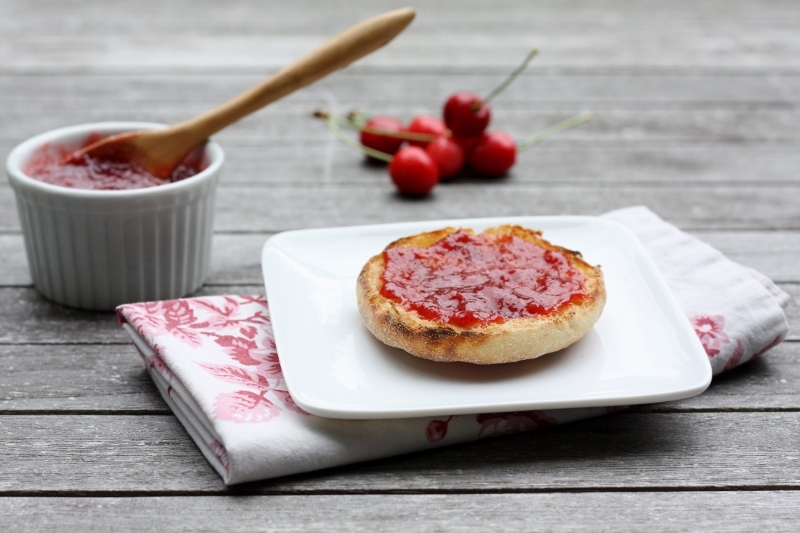 Test the set of the jelly using the saucer test (place a saucer in the freezer when you start – when you think the jam is done, place a drop on the plate and return to the freezer for 1-2 minutes, it should wrinkle when you push on it). If it doesn’t pass, return the pot to the heat and cook for an additional 5 minutes before repeating the test. When the jelly has reached the desired consistency, turn off the heat and fill the jars. Wipe rims and apply lids. Screw on the bands and lower into the water. Process in the hot water bath 10 minutes. When time is up, remove from water and cool on the counter. When the jars are cooled, check the seal by pressing on the top of the jar. If there’s no movement, the jar has sealed. Store up to one year in a cool, dark place. Makes 4 pints (yield varies depending on width of pot, cooking length and juiciness of fruit). Last spring when I was in Paris, we finally made it to this jam store that I had read about. We walked in, and I was overwhelmed. I thought I had a jam problem…but my pantry only has a few shelves full. This place was overflowing with jam, all types. It was incredible. Then we started sampling, and I swear I was in some type of jam coma – because why on earth would I ever buy jam? I could go into business myself. But no, I couldn’t stop myself. I ended up with this jar of Pear Vanilla Jam. It was the most delicate yet sophisticated flavor of jam, and one that I just had to have. The consistency was perfect – nice and runny. I had to make it for myself. I have been waiting months to see if I could reproduce that delicious concoction of pear and vanilla, and finally the pears have hit the market in full force. Last weekend I gave it a try – and the flavor is spot on – the problem is that the consistency is a little more firm than I would like. 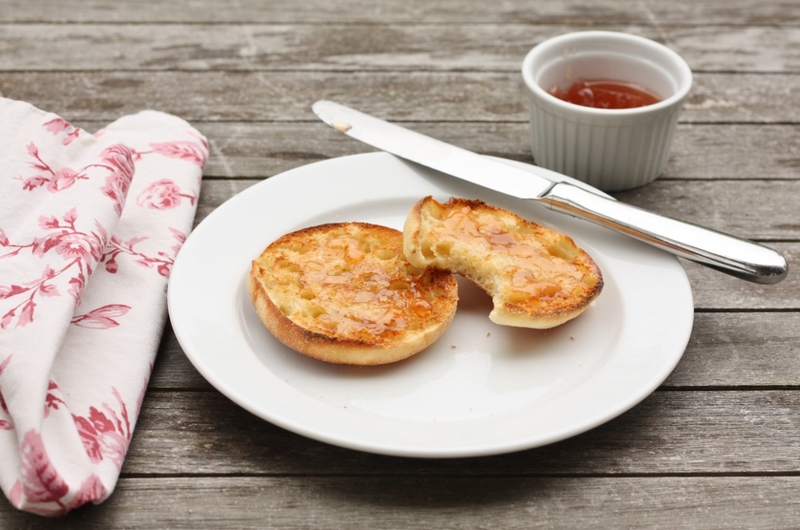 I am fine with it though – once it gets on that warm English muffin, it softens right up. 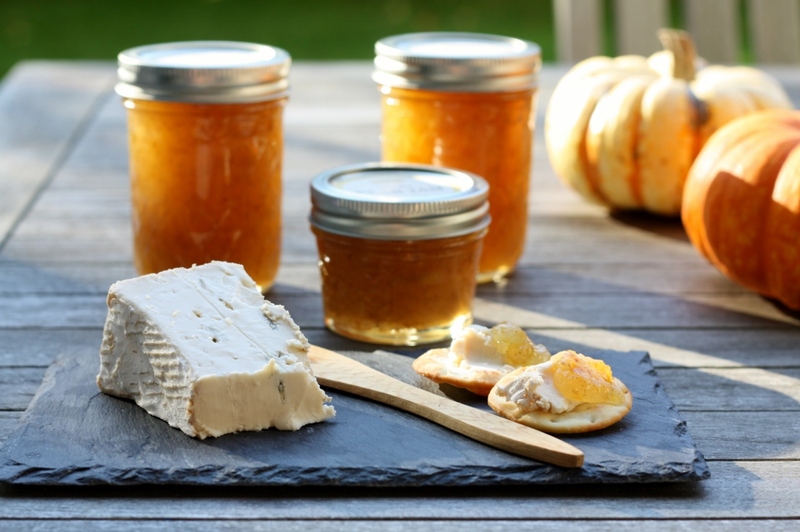 Although I found another really good way to serve this jam…with some creamy blue cheese. Wow. Talk about savoring the season. Just give me some cheese and this jam, and life can get as hectic as it needs to be. I will be sitting on the side, savoring every minute. In a large, heavy-bottomed pot, combine chopped pears, sugar and vanilla beans (and all that bean-y goodness you scraped out). Cook over medium heat until the fruit can easily be smashed with the back of a wooden spoon. Use a potato masher or immersion blender to break the fruit down into a mostly-smooth sauce (remove the vanilla bean solids before blending). Add the pectin and bring to a rolling boil. Let boil for a full five minutes in order to active the pectin, so that the finished product will have a nice jammy consistency. I can’t believe summer is almost over…and I have just begun to post all of the wonderful things I made. Unfortunately this was one of the busiest summers I have had as long as I can remember. That doesn’t mean that I stopped cooking or baking, but I definitely was not able to keep up on my postings. So, hang with me…the next few posts will be very focused on summer produce as I catch myself up. This year we had another killer cherry season. We had more cherries on our tree than I have ever experienced. And the odd thing was, the birds were a little late to the party. We were actually able to pick about 5 pounds worth before the birds got to them. We also had some other fun visitors this year – the rats. I think there was just one, and boy was he happy. I think our neighbors finally had their fill though and I haven’t seen the rat for a while. 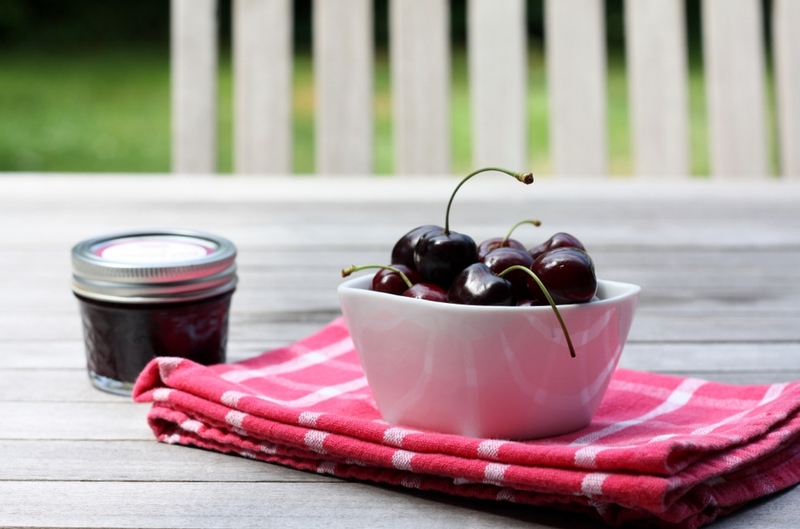 So this year I wanted to make jam with them – but that was before I found this Cherry Butter recipe in the Food in Jars cookbook. Once I saw this, I looked no further. I just loved the idea of making butter out of these amazing cherries, and as you can see, it was very much like jam consistency, without the pectin. I can’t tell you the pride I had when I had jars of this cherry butter on the counter. It is not often that I am able to can my own produce – normally it is from the farmer’s market. I was beaming. So even though cherry season may be over where you live – I leave you with this fantastic recipe for next year. And if you want to come by my house and pick your own…feel free. There should be plenty, if this year is any indication. Combine the cherries and 1 1/2 cups of sugar in a large pot and bring to a summer. Reduce the heat to low and let it gently bubble, stirring every 5 minutes or so. If it’s sticking to the bottom, lower the heat a bit more. Cook like this to at least an hour, until the butter has reduced in volume and it has taken on a deep wine color. Using an immersion blender (or working in batches in a blender), carefully puree the fruit. Taste and add the remaining sugar if you feel it needs it. Add the lemon juice and stir to combine. If it doesn’t seem at all watery and the texture seems sufficiently thick, the butter is done. If not, continue to cook until the butter is thick and spreadable, keeping in mind that it will thicken a bit more as it cools. When the butter is nearing completion, fill your canning pot with water and begin to bring it to temperature. Wash your jars and rings in warm soapy water and set aside. Put your lids in a small pot of water and heat (but do not boil) in order to soften the sealing compound. Makes 2 pints (yield varies depending on width of pot, cooking length and juiciness of fruit). Someone needs to shake some sense into me. A wise man once said, “If it is worth doing, it is worth overdoing.” Yes, I often feel like those are the words I live by – particularly this time of year. If you look into my pantry right now, you would completely agree with me. We are on the final countdown to Thanksgiving – but that is not the only thing going on in our family at the moment. We are about to embark on the Trifecta of holidays – Thanksgiving, Hanukkah and my younger daughter’s birthday – yes, all on the same day. She could not be more excited. Me, well, I would rather spread the cheer, but it is what it is. I got back from another adventure, only to be thrown right into the birthday celebrations. Last week was not my best international travelling experience when it came to sleeping. For some reason almost every night between 2:30 and 3:00am, I decided I had slept enough, and it was time for my body to wake up. I was exhausted. Three hours of sleep a night is not nearly enough for me – I can get away with it for a couple of nights – but then I really turn to mush. The good news – I was finally able to sleep on the airplane – I was just done. I couldn’t take it any longer. Aside from birthday baking this weekend, I had to get one last batch of jam in before I call it quits for the season. 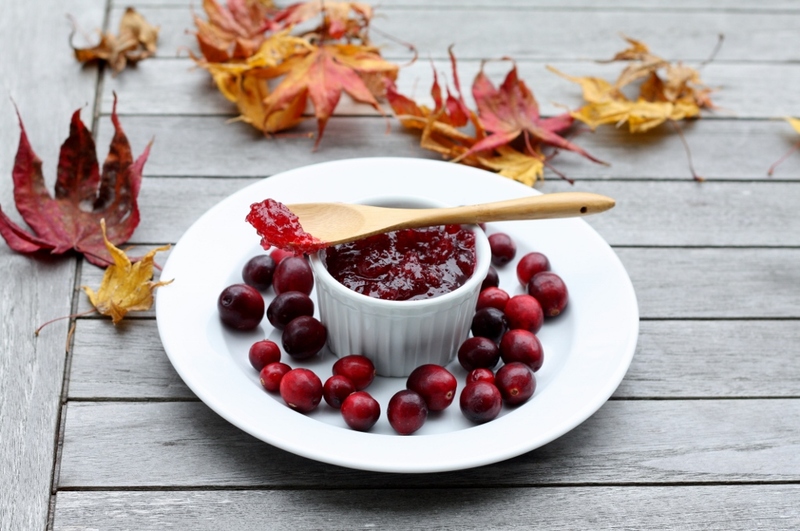 With Thanksgiving coming right around the corner, I decided to try out a new recipe from Food in Jars using cranberries and apples – both which I found at the farmer’s market this weekend. This jam is mighty delicious – and so versatile. I could see this on a peanut butter sandwich, as well as a turkey sandwich. Oh, and on a bagel with cream cheese – it would make it sing. So – as you are preparing for your Thanksgiving feast – why not make a batch of this. And if you really want to make your guests happy, give them a small jar as they are leaving. Again – this is the time of year where people tend go a little overboard – and my philosophy is, if you can over do it now, then you can rest later. Is it later yet? Combine the apples, cranberries, sugar and water in a large pot (use a big one, this jam will bubble) over high heat. Bring to a boil, skimming off the foam that develops on the top of the fruit. Cook for 10-15 minutes, until the cranberries pop and the apples soften. Add the lemon zest and juice and simmer until the liquid in the pot begins to thicken (because both apples and cranberries are naturally high in pectin, you won’t need any additional pectin to help this jam set, as long as you cook it until thick and syrup-y). If you like a smoother jam, now is the time to use an immersion blender. Ladle into prepared jars, wipe rims, apply lids and process in a boiling water canner for 10 minutes. Label nicely and distribute to those you love. Makes about 4 (1-Pint) Jars. What a week – and it is only Wednesday! I better pace myself, or I will not make it to the weekend, and my taste buds are counting on it. I just came back from a really quick work trip. Normally I travel very far away for work, but this time I spoke at a conference that just happened to be in the US – thank goodness. Fortunately I was able to fly back today and make to a meeting that started at 1pm. Of course, no trip can be complete without something going on at the home front. While I was on the airplane, the school nurse called my husband – this time for my older daughter. I am really hoping that next week we can go 5 entire days without a call from the school nurse. I visited a serious food town this week, and I really was not expecting it. Nor was I expecting who I was able to meet. 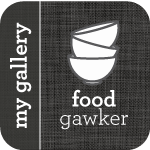 So Monday night I was in my hotel room studying the slides for my talk, when I got an email that one of my favorite food bloggers had posted an entry. That was exactly the excuse I needed to stop what I was doing and procrastinate just a little more. I actually wanted to email Kristy because I had a feeling she lived near where I was going – but that never happened. So, instead I wrote a comment on her blog and let her know where I was. Little did I know that she worked very close to the hotel I was staying at – so we arranged to meet for a drink. It really brought me back to elementary school when I had a Pen Pal who lived in Maine. One summer we decided to drive up and meet her family – and we were instant friends. We actually formed quite a bond with all those letters. It was exactly the same situation, but this time we have gotten to know each other through our blogs. We have emailed each other a few times over the years – but mostly I keep up with her through her stories. When I met her, I felt like we were old friends, and that we had known each other for years. We had a terrific evening with excellent food, really getting to know each other – and piecing the holes together from our respective stories on our blogs. Even though this is not at all why I started a blog – it is really a bonus to have met such a great person. Now what does this jam have to do with all this? Well, I made this jam at my mother’s house this summer. 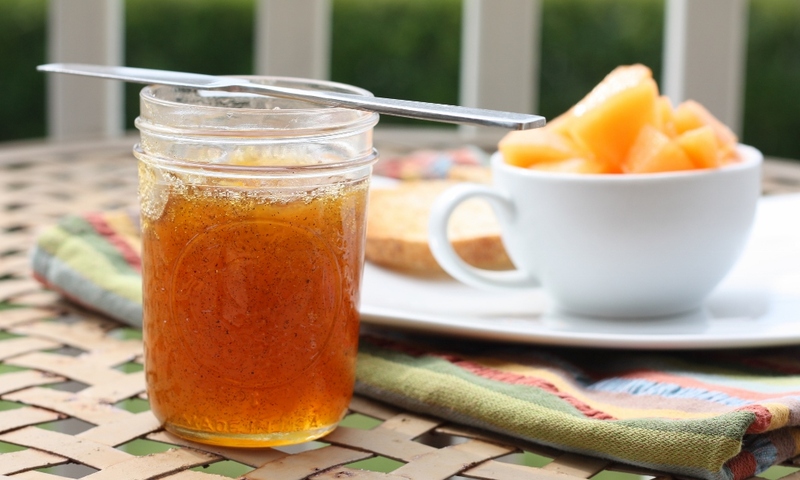 I love cantaloupe – and when I saw this recipe in Food in Jars, I had to give it a try. The problem is that we really don’t get great melon out here. Growing up, I would always have the most delicious melon at my grandmother’s house – so I waited until I was on the east coast to test it. This jam was out of this world. I had it for breakfast almost every morning – it seriously tasted like a creamsicle. What an incredible treat. Just like meeting Kristy. It was an unexpected treat, which is definitely the best kind. Prepare a small boiling water bath canner and 3 half pint jars. Place lids in a small pan of water and set to a bare simmer. Combine the cantaloupe, sugar, and vanilla bean pod and seeds in a non-reactive pot and bring to a boil. Boil for 8-10minutes. Add the lemon juice, zest and pectin and return to a boil for an additional 3 to 4 minutes, until the bubbles look thick. Remove the vanilla bean pod and discard. Carefully ladle jam into jars (depending on the concentration of the sugars in the fruit, it may reduce down further and leave you with just two half pints. Prepare to be surprised). Wipe rims, apply lids and rings and process in your small boiling water canner for 10 minutes. When time is up, remove jars from pot. Let cool. When jars are cool enough to handle, remove rings and test seals. If seals are good, store jars in a cool, dark place. If any of the jars did not seal, put those jars in the fridge and use within a month or two. I finally made it back to the kitchen. Thank goodness – that’s just about all I can say at this point. When we built our house many years ago, I remember working with the architect to tell him what our dream house would look (hoping we could afford something close to it), and I specifically spent a lot of time talking about the kitchen. I told him I wanted a really big kitchen, that I plan on spending most of our time there, and I needed a big counter for all of my crazy food projects. On the plans, it definitely looked like he centered the house around the kitchen, which was ideal. It wasn’t really a “great room” concept, it was really just a big kitchen, with some other spaces next to it. Although I was still worried that wouldn’t be enough. Soon the framers came and the kitchen was framed in – that’s when it set in that I actually got what was hoping for – and maybe it was even too big. Of course, over the years I have found use of every inch of my kitchen, and when I am stressed, there is nothing I want more than to be in my big kitchen all by myself – no music, no talking, no nothing – just me and the food. This last week, that was a big void in my life. In fact, with the little sleep that I got, I actually spent more time in my bedroom (awake typing on my phone), than any other room in my house – with the office being a close second. It was a week that I have not experienced in quite a while – one of the most intense work weeks of my life. The kind that makes you wonder if it is time to try something new. Fortunately I got through it though – and this weekend, I went back to the kitchen. I didn’t care if it was nice out – I needed to spend as much time possible making up for lost time. So what did I do? I jammed. It was soothing, and peaceful, and wonderful. The farmer’s market is abundant right now – and the apricots are just the most beautiful color and texture. 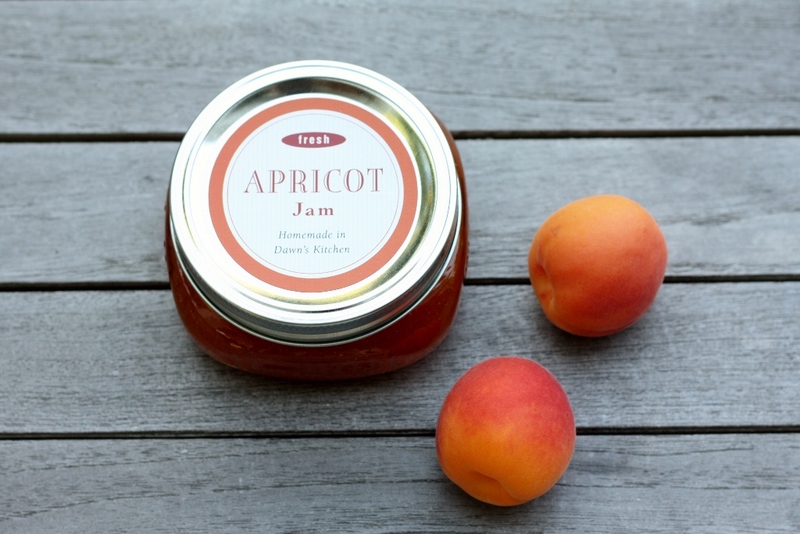 I used the recipe from the Food in Jars cookbook – and I don’t even like apricot jam. But I am telling you – there nothing better than homemade. I was scraping the side of the pot it was so amazingly delicious. I can’t wait to get that onto my English muffin in the morning…wow. We all have stressful weeks – but what is most important is how you recover. I feel fortunate that I know what I need to regroup – it is actually a gift – because it gives me the ability to continue to forge ahead. I always think back to that day when I first saw my kitchen – all framed with wood. Little did I know that room would become so important in my life – so much has gone on in that room, but most of all, it is my space. My space to be calm, be creative, and start fresh. My space to forget about the past – and find the strength to think about the future. Combine the apricots and sugar in a roomy, non-reactive pot and bring to a boil. Boil for 10-15 minutes until the fruit thickens and runs slowly and thickly off the back of a spoon. Add the lemon juice and zest and return to a boil. Insert your candy thermometer into the jam and attach it to the side of the pot. Let the jam boil vigorously until it reaches 220 degrees for 2 minutes. 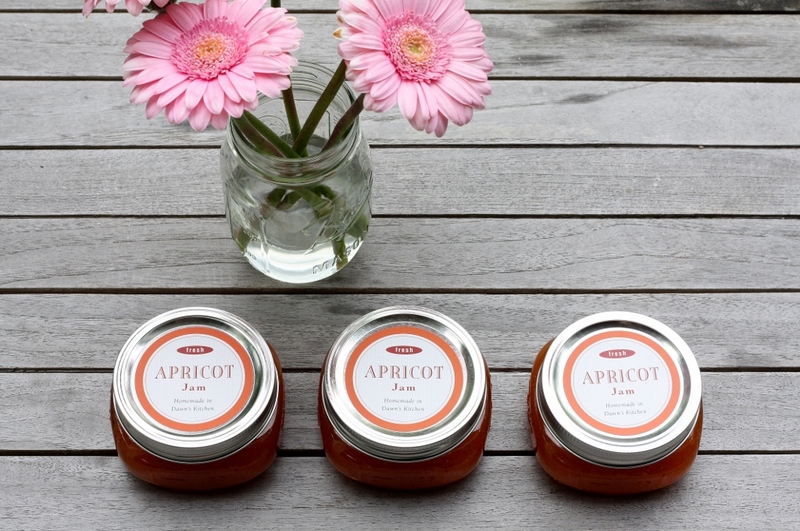 Carefully ladle jam into four half pint jars (depending on the concentration of the sugars in the fruit, it may reduce down further and leave you with just three half pints. Prepare to be surprised). Wipe rims, apply lids and rings and process in your small boiling water canner for 10 minutes. When time is up, remove jars from pot. Let cool. When jars are cool enough to handle, remove rings and test seals. If seals are good, store jars in a cool, dark place. If any of the jars did not seal, put those jars in the fridge and use within a month or two.